The Great News blog is looking back at the issue of Cheeky Weekly in which the Mystery Comic was unveiled in its full wondrousness. 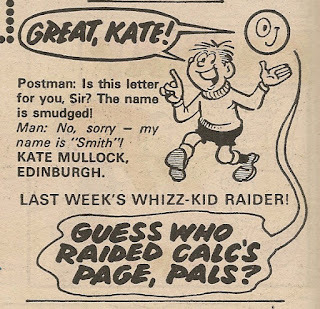 One month after Calculator Kid's story was infiltrated by Benny 'Lazy' Bones, poor old Charlie Counter and his number-crunching pal were subjected once again to the unwanted attentions of a wily Whizz-kid raider. Can you spot the intruder (and no, it's not the opportunist mouse in the final panel)? Scroll down for the answer. Once again a raid has been perpetrated by that rubbery alien sphere, Odd-Ball. This Calculator Kid episode is revealing, as we learn that Calc doesn't always act in Charlie's best interests, since the sentient silicon chip is aware that the directions he is giving his pal will culminate in dental distress. This is the sixth time Calculator Kid has been subjected to a raid, and the fourth time that Odd-Ball has impinged on the doings of Charlie and Calc. This raid is the 16th carried out on our ex Cheeky Weekly chums, who have carried out 8 cross-border sorties into Whizzer. The Friday element of Cheeky's Week was the occupant of page 23 in the first two issues of Cheeky Weekly, but the same location in issue 3 was home to 'More Joke Strips' – a further supply of funnies to be used in conjunction with the Friend of Cheeky Fun Wallet that had been presented as the free gift a week earlier. Cheeky Weekly's juvenile philanthropist Mustapha Million then commenced a 6-week run on page 23 before being displaced by a returning Friday in the 31 December 1977 Christmas issue. The gag-evaluating panel which comprised Joke-Box Jury then turned up to pronounce judgement on the week's batch of reader's funnies (or otherwise). The following week page 23 was the site of 2 half-page ads, the first for IPC's iconic football-focused title Roy of the Rovers, and the second reminding potential readers that the publisher's humour comics Whoopee!, Whizzer and Chips and Krazy were all running the second instalment of their respective Spotter Book cut-out-and-keep pamphlets. The toothy funster's comic was of course running its own Spotter Book concurrently. Mustapha then resumed occupation of the subject page for a run that lasted 14 weeks before being interrupted by a page containing a half-page ad for Whizzer and Chips which that week (cover date 29 April 1978) contained the second part of a guide to the solar system alliteratively described as a 'planet panorama'. Sharing the page was a handwritten note from Cheeky asking readers to send in their Father's Day messages for inclusion in an upcoming edition of the comic. Plucky Mustapha then took up occupation once again for a further 8 weeks, culminating in the comic dated 24 June 1978. This would be our moneyed mate's penultimate visit to page 23. A week later Friday was back, and held on to the location under review for 4 issues before being interrupted for one week by an ad for Peter Pan Playthings' range of outdoor toys, not coincidentally in time for the start of the school holidays (issue dated 29 July 1978). Friday then returned for a single week, being ousted in the following issue by a surprise appearance on page 23 of Saturday – the only time this particular feature would come to rest in that location. However, Friday was also missing from page 23 a week later when Joke- Box Jury came to rest there. A 5-week run of Friday then commenced, and in the 30 September 1978 edition there were more gags and groans as the Joke-Box Jury team returned. A week later What's New, Kids shared the page with an ad for the 1979 Krazy Annual, which would be welcome news for those still mourning the demise, in April of that year, of the comic which spawned our grinning hero. Friday was then back for 3 weeks, before the surprise appearance of Calculator Kid, the only visit by Charlie Counter and his battery-powered buddy to the page in question. In the following issue, page 23 was home to 2 half-page ads, one for IPC's Mickey Mouse comic and the other promoting cereal manufacturer Nabisco's less-than-thrilling breakfast biscuits, Shredded Wheat. Johnny Morris, presenter of TV's Animal Magic, was fronting a campaign inviting consumers of the straw-like comestible to send off tokens which would translate into cash for animal charity the PDSA. As a sweetener (which is something the bland wheaty slabs were certainly in need of), those sending off the cardboard coupons stood the chance of winning a radio cassette player. A week later Friday returned, but the following issue (dated 25 November 1978) saw IPC announcing on page 23 their upcoming '4 Papers Competition' including prizes of Corgi's model Jaguar car based on that driven by TV's Simon Templar aka The Saint, the ad sharing that location with another promotional push for Mickey Mouse comic. There was not a little upheaval in the ensuing edition, due to an industrial dispute which reduced the effective page count from the usual 32 to 27. The promised 4 Papers Saint Competition went ahead, but this and the loss of available pages resulted in Tweety and Sylvester's final appearance making a surprise page 23 manifestation. The next issue was similarly afflicted (although regaining one page to make 28), and the consequent disturbance saw another newcomer to page 23 – and also bowing out of the comic as of this issue – Laugh and Learn. Cheeky Weekly then disappeared from newsagents altogether as industrial relations broke down entirely, returning with an issue dated 06 January 1979, in which the lucky winners of the Chutes Away competition, which ran in the 16 September 1978 edition, were announced on page 23. The 13 January 1979 comic saw the commencement of the cut-out-and-keep feature The Friends of Cheeky Snap Game, which was to run across 4 issues. The need to have the cards necessary to play this variant on the traditional snap game boast colour images of the toothy funster and and pals meant they were printed on the centre pages, displacing Elephant on the Run. This disturbance to the normal order of things resulted in Skateboard Squad fetching up on page 23 for this and the subsequent 3 issues. 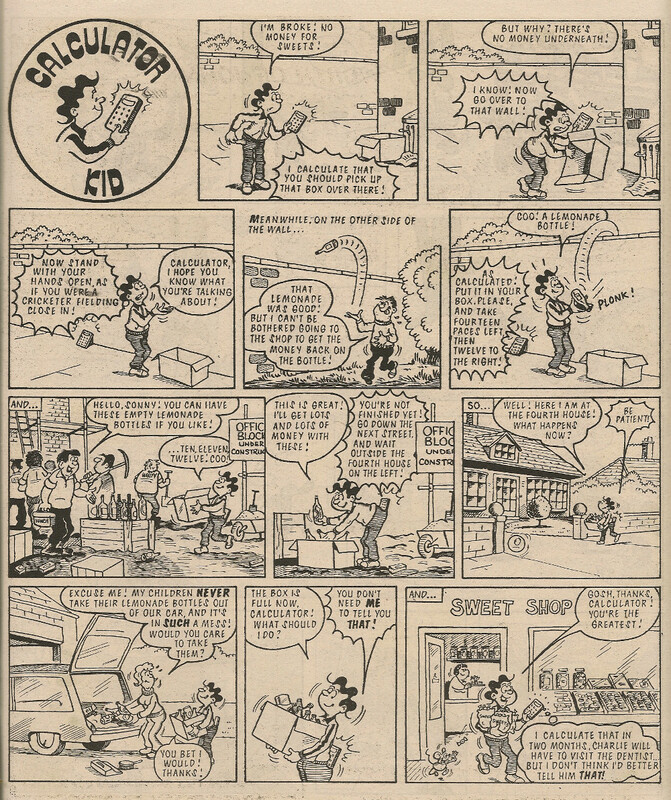 The loss of Cheeky's weekly cinema visit, which came to an end in the 02 December 1978 comic, caused a subsequent perturbation to the distribution of the remaining strips that, due to the truncated issues and presence of the snap game, really only became apparent as of the 10 February 1979 comic when, among other shunting of features, the Thursday element of Cheeky's week turned up on page 23. Having said that, in the following issue the juvenile jest judges of joke-Box Jury moved back in the following week, but were deposed by Thursday for 2 weeks and then Skateboard Squad for another fortnight. Page 23 in the 24 March 1979 issue was no doubt scoured by those readers who had entered the Saint competition back in December 1978, containing as it did a list of lucky prize winners. A week later IPC's 1979 Star Guest promotion began and the subject location hosted a visit by Lolly Pop from Whoopee!. Thursday then returned for a 8-week run, interrupted in the comic dated 02 June 1979 by Speed Squad, after which Thursday resumed for 4 weeks. Another Star Guest came to rest on page 23 in the 07 July 1979 comic, and this time the visitor was Whizzer and Chips' pesky prankster, Joker. The following week the page under review was home to 2 ads for summer specials, wherein readers would be able to catch up on the holiday doings of the characters from Whoopee! and Jackpot respectively. Speed Squad then returned for a week before being displaced by yet another page of ads – this time an ad for the debut issue of Walt Disney's Puzzle Time shared space with a message from the people at North Pacific Flyers who were keen to set the parks of the nation swarming with their rubber-band-driven model aircraft. Speed Squad regained control for 5 weeks, but in the following issue page 23 hosted a half-page competition to win Lone Star's facsimile of James Bond's pistol from 007's latest cinema outing, Moonraker. This competition shared the page with an ad for the first issue of IPC's 'super new mag for young soccer fans', Top Soccer. More ads, the main one promoting IPC's '5 Top Comics', namely Cheeky Weekly (natch), Whizzer and Chips with Krazy Comic, newcomer Jackpot, Whoopee! and the veteran Buster, appeared 7 days later. Speed Squad re-established control for a further 3 weeks, after which What's New Kids moved back in. However, the terrific trio were back a week later for the first of a 4 week sojourn, which was to conclude their appearances on page 23 and bring to 14 their total visits to the site in question, making them the third most regular inhabitants. Adding the 6 appearances of Skateboard Squad (same team members but different name and modes of transport) would bring the total to 20, making Skipper, Skatie and Wipe-Out the second most regular occupants of page 23, if you choose to focus on characters rather than strip titles. 7 days after the intrepid trio bade farewell to page 23, Elephant on the Run began a 5-week residency before being displaced in the 22 December 1979 issue by Snail of the Century, the only time that Cheeky's mollusc mate's very own feature fetched up at the subject location. The following issue was the eagerly-anticipated Christmas edition, but sadly page 23 was given over to a quiz page which, though festooned with festive imagery, had a distinct whiff of 'filler' about it. The perplexing perorations of Paddywack then made a surprise visit to page 23, and a week later Elephant's run brought him back to page 23 for the final time. In the following issue the subject location was again the site of a valedictory appearance – on this occasion Friday made its final visit to page 23, bringing to 17 the number of times Friday appeared on the page under review and making Friday the second-most regular occupant (unless you're one of those contrary folks who have decided to lump Speed and Skateboard Squad's appearances together, in which case Friday is the third most regular visitor). The penultimate Cheeky Weekly saw bus-based buddies The Gang make a late bid for control of page 23 but in the final edition of the comic, Mustapha Million returned after being absent from that page for 84 weeks. Mustapha was the most regular page 23 resident, having appeared there 30 times. Employed to keep things clean in Krazy Town, Sid the Street-Sweeper made his first, uncredited appearance in Krazy dated 01 October 1977, where he was seen clearing away the detritus during the coda to Cheeky's typically hoary Knock-Knock Door gag. 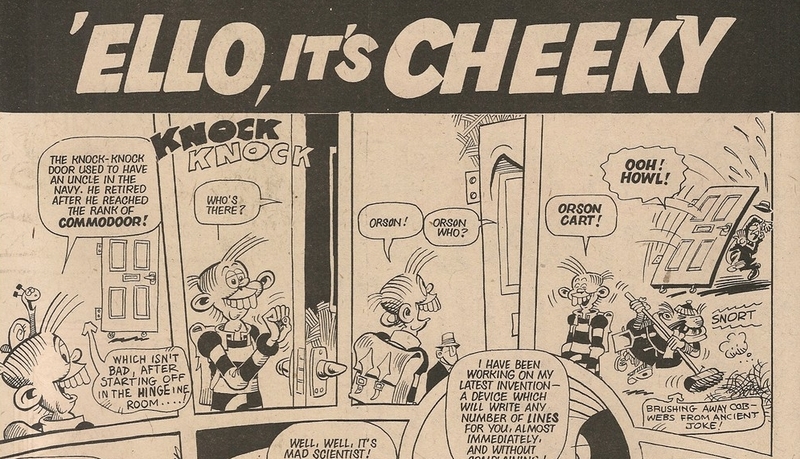 Sid wasn't seen again in the pages of Krazy until its final issue dated 15 April 1978, but he was present in the inaugural edition of Cheeky's own title, which was published just 3 weeks after the comical cleansing operative made his Krazy debut. It has to be said that Sid wasn't the most diligent refuse collector – he was always looking for an opportunity to sweep rubbish under cars, down drains, beneath loose paving slabs or into any suitable below-ground-level aperture including those frequented by Manhole Man and, in the 31 December 1977 edition, into his mother-in-law's front garden. Sid was among the guests at the Cheeky family's New Year party in the 07 January 1978 issue, and was the source of the Mystery Comic (secreted under his hat, not in his rubbish barrow) in Cheeky Weekly dated 28 January 1978. 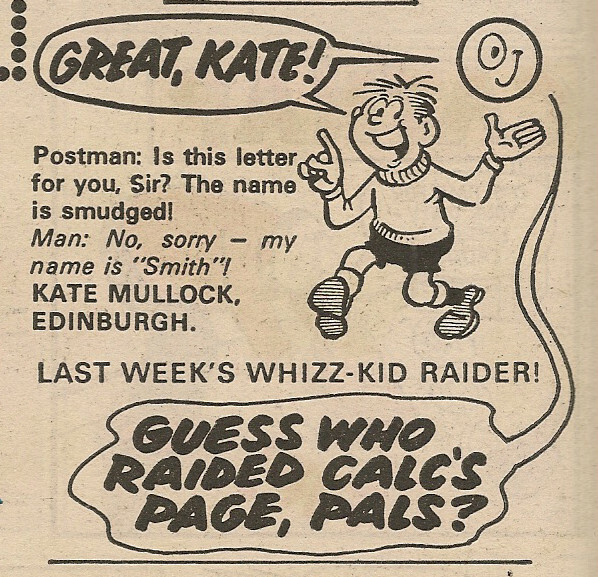 The 29 April 1978 edition was the issue to feature the most appearances by Sid, who turned up on 4 days as he handed Cheeky pages of the Mystery Comic that he came upon during his cleaning rounds. Since at that time readers had yet to witness the whole of that perplexing publication, Cheeky was anxious to secure that week's Mustapha Million story, and fortunately we were spared 2 blank pages as Sid located the vital elements on Friday. However, this time the pages were found at the bottom of his refuse collecting bin, but that week's MM story showed no sign of grubbiness when printed in the comic. 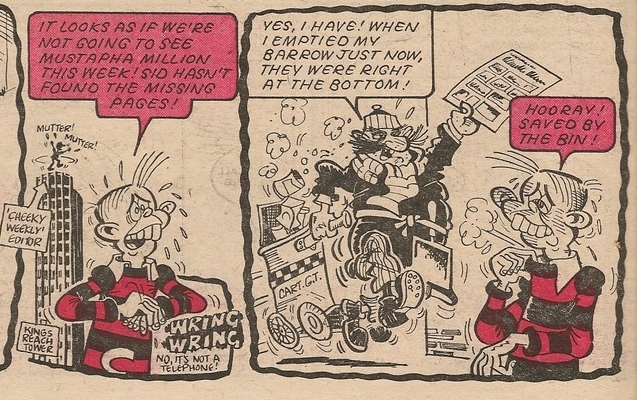 In the course of Cheeky's Week as depicted in the comic dated 06 May 1978 Herman the Traffic Warden, in his pursuit of the world parking ticket record, apparently stuck several penalty notices on Sid's barrow, although we only witnessed this happening on Friday. Herman would also gleefully affix a ticket on Sid's barrow during Cheeky's trip to the seaside in the 08 September 1979 issue. Sid provided Cheeky with the Cheeky's Pal Puzzle in the 11 November 1978 edition, and the map that was the subject of the poser two weeks later. The mirthful muck manager made a single appearance on the cover when, on the front of the 17 February 1979 issue, he was featured as a member of the Joke-Box Jury panel. Cheeky Weekly 22 December 1979 - the toothy funster's handing out his Christmas cards...the only appearance of Sid's wife. 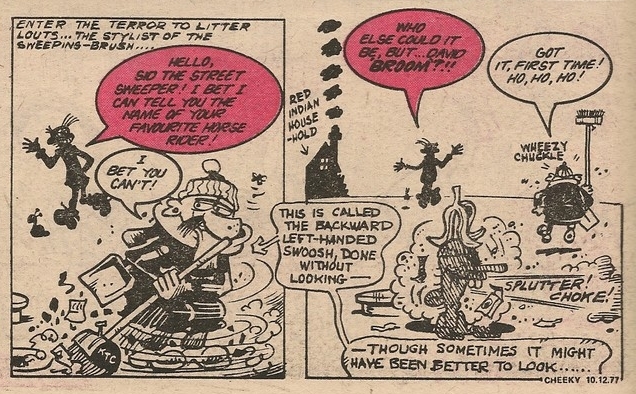 The streets of Krazy Town must have been accumulating rubbish during Sid's longest absence from the comic - 13 weeks between the issues dated 09 June and 08 September 1979 (the aforementioned occasion of Herman's issuing a parking ticket while on the promenade). Maybe on his return Sid found the strain of clearing the massed refuse a little too taxing, because his second-longest absence occurred not long after – the 12 weeks between the 29 September and 22 December 1979 editions. Our litter-gathering chum was the subject of the Pin-Up Pal poster in the comic dated 08 April 1978. 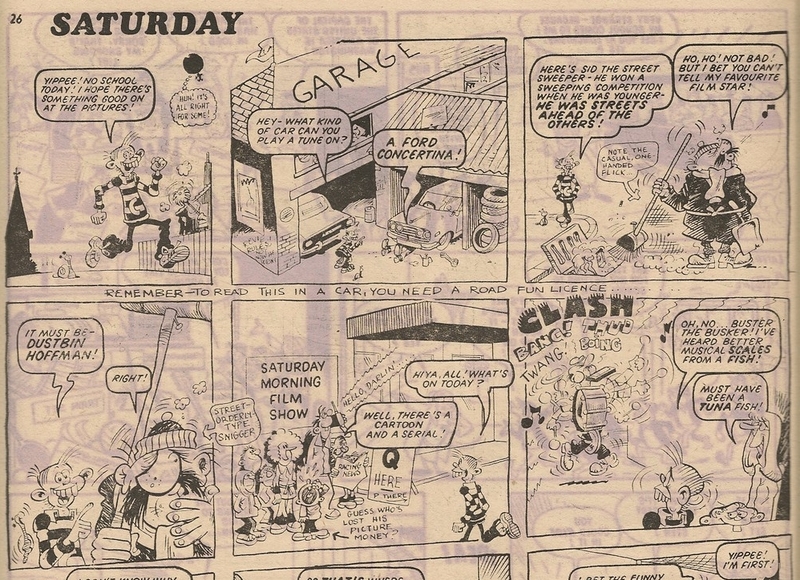 Sid didn't quite make it to the final edition of Cheeky Weekly – his appearance in the 05 January 1980 comic was to be his last, having swept through a total of 56 issues.